Have you ever been asked to provide a reference for someone? 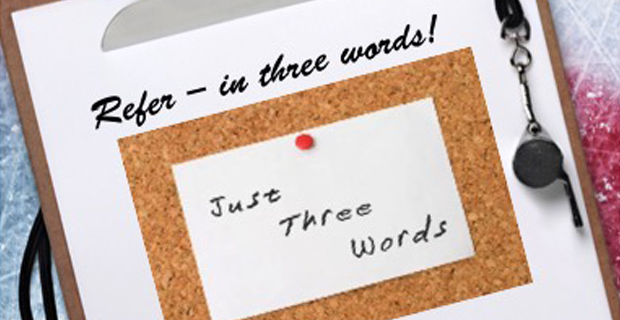 Could you do it in three words? Referrals are a common request of teachers. In hockey, too, I’ve frequently been asked to be a reference for coaches or those wishing to coach. But not often have I had to provide a recommendation for a player. This isn’t the same as a scouting report. Like all coaches, I’ve had scouts wonder about this kid or that. But the form I recently filled out for a boy was an altogether different matter. A parent asked me to complete a recommendation sheet for his son who’s applying to a private school, one of those hockey academies that have proliferated across the country in recent years. What I wrote isn’t germane to the topic, which is, what should a coach say to recommend a former player? In fact, I wasn’t given much of a choice. The form had no space for me to write about him. It had a list of ten “soft skill” characteristics and a sliding scale from “excellent” to “poor” to...”do not know”. How on earth could a coach answer “do not know” about a player’s qualities once you’ve spent an entire season with him? That one baffled me. Yes, I do know, or at least I have a pretty good sense. The one question that left me thinking asked, “What are the first three words that come to mind when you describe this applicant?” I came up with about seven. I actually wrote them down, tried to prioritize, then alphabetize, and then reverse alphabetize. Then I re-ordered them to reflect change in his approach over the season versus the result when the season was over. Not done, I looked at the lists and wondered if any could be construed as negative. If I’m giving a recommendation, shouldn’t it be positive, hence the word “recommendation”? Now if I were providing a scouting report, it might be different. Why three? What’s society’s insistence on three? Three’s a crowd? Three cheers? Three contestants on Jeopardy? Three strikes and you’re out? What’s baseball got to do with it? Will these three characteristics be regarded by the school as being in order of importance? And what of the directive to come up with the words as the first ones to come to mind? What’s wrong with the second ones that come to mind? Or the ones that, upon some serious reflection, best describe him? Hopefully, whoever reads it either never played much baseball or rarely struck out.